Your Voxler® serial number is located on the CD cover or in the email received with the download directions. You may also access your serial number at any time by clicking the Help | About Voxler command in Voxler. Please remember to register your software by filling out the registration form online. Registering your serial number entitles you to free technical support, announcements, and Voxler upgrade pricing. Our database is confidential. Please take a minute to register your copy of Voxler with us. The first time you open Voxler, the program requires your serial number. 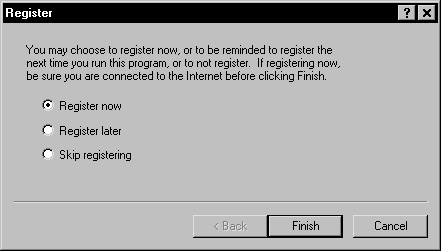 After the serial number has successfully been entered, the Register dialog appears. It is highly recommended that you register your serial number. serial number the first time you start Voxler. Select Register now and click the Finish button to open the Golden Software website to complete the online product registration. Select Register later and click the Finish button to be notified to register the next time you open Voxler. Select Skip registration and click the Finish button to prevent further notifications. Voxler saves the registration information in the computer's registry. You must be logged in to the computer with Administrator rights to save information to the registry. If you cannot save this information to the registry, then the program will prompt you to register the software each time you open it. If this is the case, select Skip registering and click Finish.